With more than 11,000 new books issued a year and 500 million books sold annually, Random House is the world’s largest general-interest book publisher, churning out books from different genres and cultures that open the gates to new worlds and new insights. 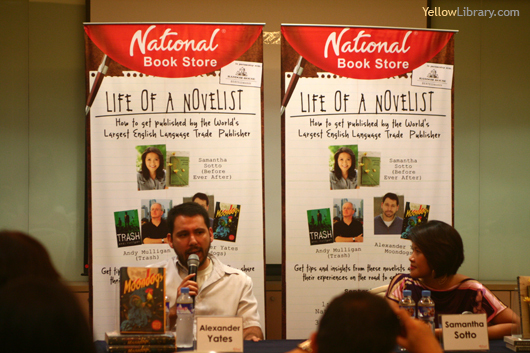 Now we put the spotlight on three authors from the international publisher, whose books talked about the Philippines and its colorful people. Get a rare opportunity to join filipina Samantha Sotto (Before Ever After), Andy Mulligan (Trash) and Alexander Yates (Moondogs) for an afternoon set to pique the interest of writers and readers. Get tips and insights from these novelists as they share their experiences on the road to getting published. Hi admin, thanks for sharing! Was able to attend. Though i don't have any plans to be a writer I enjoyed it just the same. Sad to say i had to leave early so I wasn't able to finsih it. Here is a photo I took.